On a fortnightly basis, global equity markets traded higher on news of a ceasefire accord in Ukraine coupled with hopes of a resolution between debt-strapped Greece and its creditors. Over the fortnight, investors were cautiously optimistic that the European Union would make progress on a debt deal with Greece. Further, markets called back expectations on how fast, and how far, the Federal Reserve might raise interest rates in coming months and years after the Federal Reserve policymakers expressed concern last month that raising interest rates too soon could pour cold water on the U.S. economic recovery. In case of the rupee, the currency depreciated by 0.3 per cent to nearly four-week low of 62.17 as investors turned cautious after the Arvind Kejriwal-led Aam Aadmi Party (AAP) decimated the Bharatiya Janata Party (BJP) and the Congress in a landslide victory secured 67 of the 70 seats in the Delhi assembly elections. Also, capital outflows and fresh dollar demand from banks and importers acted as negative factors. However, sharp losses were cushioned as Wholesale price index fell for the second time in three months in January as oil prices slumped, bolstering prospects for further interest rate cuts by the Reserve Bank of India (RBI). Further, consumer price inflation came in at 5.11 per cent, well below the RBI's medium-term target of 6 per cent, and trade deficit shrunk to an 11-month low. International spot silver prices declined by around 2.76 per cent in the past fortnight while MCX silver prices also declined by around 2 per cent. Fall in gold prices and profit booking at higher levels dragged prices further. Copper turned out to be the only gainer in the base metals space with prices surging by 1.4 per cent. Possibility of a deal between Greece and its European creditors after Greece will seek an extension to its rescue deal from the rest of the euro zone signaled a shift in the standoff between Athens and its creditors. The possibility of an agreement that would keep Greece within the EU sparked optimism in copper markets. Also, weakness in the DX after Fed policymakers noticed how China's economic slowdown and tensions in the Middle East and Ukraine posed downside risks to the U.S. economic growth outlook supported gains. MCX copper prices jumped by 1.4 per cent in the last fifteen days owing to Rupee depreciation. WTI oil prices declined by 2.61 per cent in the past fortnight while MCX oil prices declined by around 1.4 per cent. Oil prices traded lower last week after industry group American Petroleum Institute estimated a supply build of more than 14 million barrels. Besides, oil stockpiles in member countries of the Paris-based Organization for Economic Cooperation and Development (OECD) may approach a record 2.83 billion barrels by mid-2015, said the IEA. Threats to Middle East crude production and the falling U.S. oil rig count seemed to spur market bulls despite global inventory data suggesting an oversupply of up to 2 million barrels per day. On the contrary, violence in Libya has shut all major ports and oil exports from the country have collapsed to just a trickle. Iraq's semi-autonomous Kurdistan Regional Government has threatened to withhold oil exports if Baghdad failed to send its share of the budget. Gold and silver prices are expected to trade lower on strengthening dollar, easing Greece situation, and growth and optimism in the US economy. Although, investment demand has revived in the recent weeks, it has to be consistent for prices to turn back to its upwards trajectory. 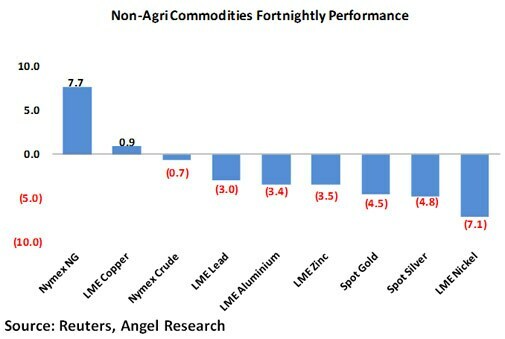 Base metals are likely to trade lower in the coming fortnight owing to lower volumes as Asian markets remain closed till 24th Feb'15 for the Lunar New Year. Investors also will be keeping their eyes on purchasing manager indexes scheduled to be released toward the end of the month to gain a better idea on how the manufacturing sector in Asian and European countries fared in February. Chana: - In the last fortnight, chana traded on positive note and gained 4.2 per cent due to good market demand and restricted supply. The new chana crop has hit the local markets but the supply is still lower than expected. As per the 2nd Advance estimates by Department of Agriculture & Cooperation (DAC), country is likely to harvest 13per cent lower chana in 2014-15 from last year on lower planted area (down 16per cent Y-O-Y). On the import front, India imports around Rs 1.54 lakh metric tonnes chickpeas during Apr-Oct 2014, which is more than 50 per cent of quantity imported previous year. Moreover, harvesting of chana will soon commence in southern India and Maharashtra. We expect that on lower production and late arrivals of new crop might keep the prices higher but duty free imports may keep pressure on chana prices at futures trade. Oilseeds and Edible oils: In the last fortnight, we have seen mixed to positive trend in price movement for Oilseeds and Edible oil. In the domestic market, soybean traded mixed on declining export demand for the oil meal. There is still good buying support by the oil mills at lower prices as supplies from producing belts are declining. In the world market, Soybean exports continue at a record pace as USDA raised soybean exports by 20 million bushels to 1.79 billion bushels. The sentiments also remained largely mixed on higher supplies expected from South American crop as well as good export demand from China. Refine Soy oil and CPO futures prices traded mostly flat mainly due to good supplies in the spot markets on good imports. As per SEA data, soybean oil Import has shown 131per cent growth in Jan 15 as compared to Dec 14. India's palm oil imports in January dropped more than a fifth from a month earlier to 658,670 tonnes as refiners increased overseas purchases of sunflower and soyoil, as per SEA data. Indonesian crude palm oil output is estimated to have fallen around 5 per cent in January from December, hit by wet weather in key growing regions. The crude palm oil export tax for March is kept at zero, unchanged from February to boost exports. Mustard seed gained about 2 per cent during the last fortnight on lower production estimates. In 2014/15, production is estimated at 7.36 million tonnes on lower acreage. Higher supply of soybean in world markets and lower demand of soy meal might keep soybean prices under pressure. Mustard seed might trade on mixed to positive note on lower production estimates. 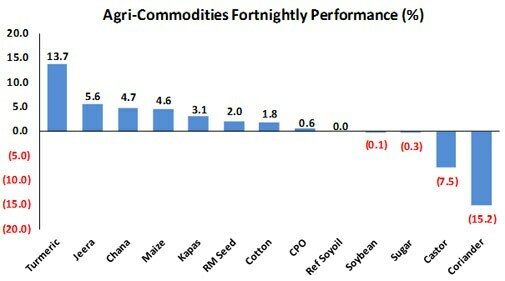 However, Ref soy oil and CPO are expected to trade lower in the coming fortnight due good supply of imported stocks. Cotton, sugar - Among softs, Cotton futures gained 2.5 per cent in the last fortnight on good demand from the millers on better export prospects as world production is expected to be lower than consumption, first time in five years. During last week, CCI has increased the floor prices by about R200-300 per bale for the e-auctions conducting across the states. Meanwhile the cotton production is estimated at 351.5 lakh bales, slightly higher than the previous estimate release in September 2014, according 2nd advance estimate by DAC. Earlier, the Cotton Association of India (CAI) revised total domestic cotton projection downward for 2014-15 to 39.7 million bales (of 170 kg each), slightly lower than the production of the previous estimate of 40.2 million bales. Sugar prices have witnessed a range bound movement and gained 0.3 per cent in last fortnight on hope of export incentives. The Cabinet Committee on Economic Affairs (CCEA) has approved the continuation of the incentive scheme for marketing and promotion services of raw sugar production during 2014-15 (October-September) for a quantity of 1.4 million tonnes. According to ISMA, the sugar production has reached 16.71 million tonnes as on Feb 15 for the 2014-15 season, as against 14.53 million tonnes in the year-ago, a rise of 15per cent. The cotton prices might trade sideways as the demand are good at lower prices and sugar might trade on mixed to positive note as export subsidy has been approved but ample supply in the domestic market may pressurize the prices. Spices: Last fortnight jeera and turmeric prices were quite volatile and traded mostly on positive note. Jeera price during the fortnight surged from Rs 14,300 per quintal to Rs 15,400 levels and closed at Rs 15,170. It has made a low of Rs 13,640 and recovered almost 11 per cent. The new season jeera has now started arriving in Gujarat markets but less than expected arrivals and good export demand keep the prices volatile. According to government data, there is 42per cent drop in acreage in Gujarat. Among agri-commodities, Turmeric gained maximum during the fortnight on good export demand and news on crop damages in the south. In the last week, the turmeric prices witnessed sharp rise in prices from Rs 8,070 per quintals to Rs 9,196 levels. It has a gained 13.7 per cent after making a low of Rs 7,942 during the fortnight. In contrast, coriander prices decreased 15 per cent in the fortnight on reports of record sowing in Gujarat. Market participants are more interested towards reducing positions amid ample stocks in the spot market against sluggish demand. We are expecting Jeera and Turmeric prices to trade on a mixed to positive note on good export demand but profit booking at higher levels is expected. New season arrival pressure may keep prices down in case of coriander.